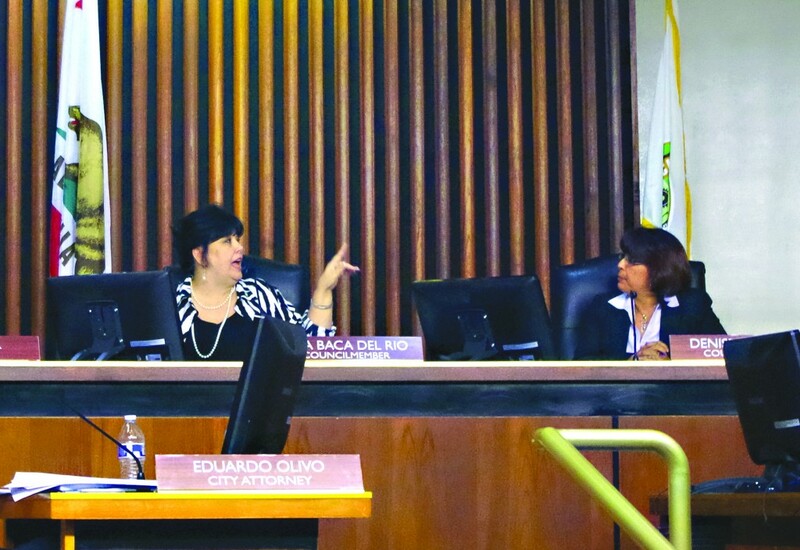 Mayor Baca Del Rio [l] confronts Council-woman Denise Robles at a Commerce Council meeting. After $26,000 fine in 2011 for violating campaign rules, the Mayor is target of similar violations and will face additional fines. Hews Media Group-Community News has obtained documents showing that Commerce Mayor Tina Baca Del Rio was fined $26,000 by the Fair Political Practices Commission in April 2011 pertaining to seven counts of failing to file timely campaigns statements. After learning and inquiring about the 2011 violations, HMG-CN found that Baca Del Rio is once again under investigation for similar violations and could face additional massive fines. The new FPPC investigation commenced October of 2013. Baca Del Rio was recalled from Commerce City Council on November 2008 and was subsequently reelected to the City Council in March 2009. The outspoken city council member is currently in the process of being removed from office in a recall campaign that has been waged by a group of long time community residents. According to officials at the FPPC, in 2011 Baca Del Rio was slammed with seven counts of failing to file pre-election and semiannual campaign statements for her candidate controlled campaign committee Friends of Tina Baca Del Rio. State officials also said that Baca Del Rio violated the Political Reform Act by failing to timely file three semiannual campaign statements between July 2007 and June 2008 and again from October 2008 through December 2009. The FPPC levied a fine of $26,000. Baca Del Rio has verbally attacked several members of the community and media lately during public meetings when the subject is brought up. State officials said that she also failed to file to pre-election campaign statements for July 2008 through October 2008 and failed to timely file to pre-election campaign statements from January 2009 through February 2009. Commerce Councilwoman Lilia Leon, once an enemy of Baca Del Rio, calling her an outrageous spender of city money and asking residents to recall her in 2009, is now strong political friend and staunch ally. Leon is also facing removal from office as well as councilmembers Joe Aguilar and Ivan Altamirano. Many question Baca Del Rio’s campaign statements that document a $24,000 loan by her personally to help defray past political campaign committee expenses. At the time, the Community News was told that Baca Del Rio was an unemployed homemaker earning only $13,000 per year, according to documents obtained, and sources said that she was renting the house she lived in. It is rumored that Craig held a fundraiser after the 2011 $26,000 fine was levied, but the Community News could not confirm that statement. Calls to Mayor Baca Del Rio went unreturned.